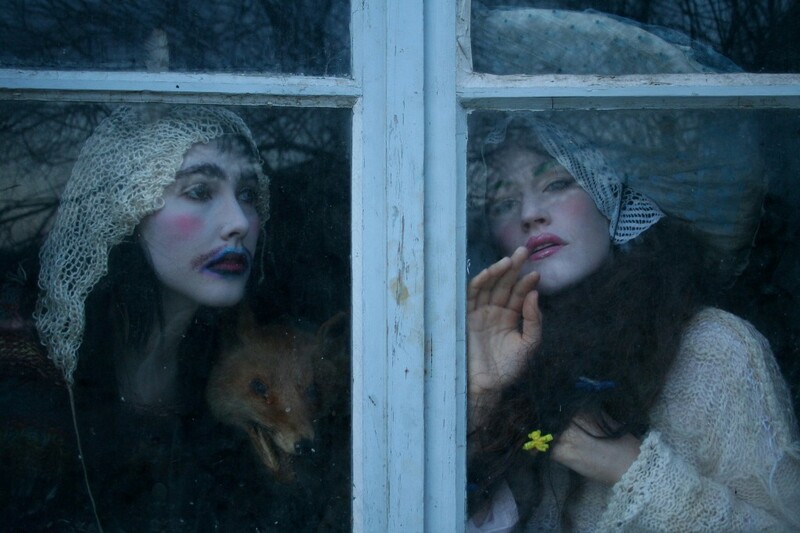 In an attempt to capture CocoRosie’s essence in a named genre, critics have given their music designations such as psych-, neo-, and freak-folk. These reductive labels only begin to describe the duo’s sound. Bianca Casady, the “Coco” to her sister Sierra’s “Rosie,” gave her own description of their music: “child ghost ceremony.” A cryptic moniker, yes, but a fitting one for their otherworldly sound. Their fabricated world is something the sisters acknowledge eagerly. They explained that “having a really developed imaginative universe is pretty much where it’s at.” Bianca continued, “We don’t really care about all of the material realm so much.” Although known primarily as musicians, much of this fantasy world and its aesthetic rely on visual arts. Bianca was an artist before CocoRosie was formed, and she is still very active in this world. If her music is “child ghost ceremony,” her description of her art is equally as whimsical: “tea-stained memoirs.” A visual parallel to CocoRosie’s music, Bianca’s art is often a collection of various pieces, seemingly makeshift collages of found objects. The conflict between hard and soft is often on display in her work. Violent scenes and haunting, soulless eyes are portrayed with muted colors and organic lines. This expressive style is often in service of a message, a comment on social systems and their oppressive nature. Her challenge to this world could be seen in her exhibition Daisy Chain at Cheim & Read gallery in New York during the summer of 2012. 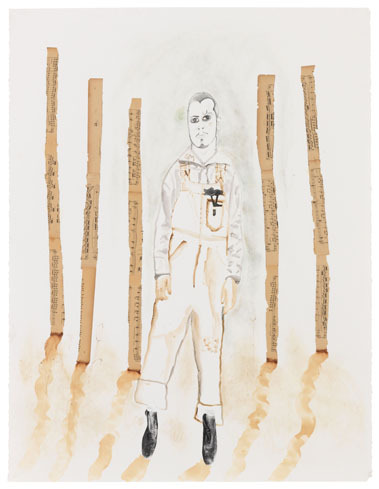 Inspired by Our Lady of the Flowers by Jean Genet, the series of watercolors, drawings, and collages centered on life in prison and the power relationships that exist there. The cell block was not always literal; Bianca described the work to ArtInfo as “looking at different types of imprisonment, the general role of servitude, and exploring a maid’s life, a slave’s life.” Sexually charged and graphic at times, her work also revealed a glimpse of hope; she explained that “eventually the prison bars become rosebushes and floral patterns. There’s a constant striving for transcendence, even when it’s happening in the prison cell.” This fantastical transformation, highlighting the contrast between the beautiful and the unsightly, echoes the invention in CocoRosie’s music and the visual components that accompany it. Bianca is responsible for CocoRosie’s visual elements, including album art, costumes, and video work. Their performances feature elaborate costumes, fanciful headdresses and childish makeup that openly toe the line between kitsch and glamor. As a New York Times Magazine feature on the sisters noted, CocoRosie’s “professed patron saints are drag queens from the 1970s,” and like them, “costume is an essential part of the performance.” Bianca’s rule is “to put on the things you like least, things you hate the most. Things that give you pain.” This preoccupation with discomfort and those who are made uncomfortable in society is a consistent thread in her work. For Bianca, the processes of making music and visual art are one and the same. “It’s all very closely connected,” she told ArtInfo. “As I personally don’t find a need to have a hierarchy of mediums with myself, I’m happy about these things merging more.” In an interview with Paper Magazine, she explained that she approaches both music and visual art “with a kind of gaudy patchwork style of contrasting objects. They thematically match, and they provide relief from the other.” The mediums are complimentary, each with its own benefits. “Although language and lyrics are my first love, I find language is restricted in ways that the image is not,” providing good reason for her to keep practicing both. It’s a good thing that music remains a productive outlet for Bianca. Yoko Ono asserts that “CocoRosie is the shower we need now in the musical desert.” CocoRosie’s idea of art – balancing beauty and pain, charm and repulsion, the aural and the visual – is a wholly comprehensive one and certainly is refreshing.